Digital Mom Blog > blog > The Beatles on iTunes – Whoopty Doo. The Beatles on iTunes – Whoopty Doo. 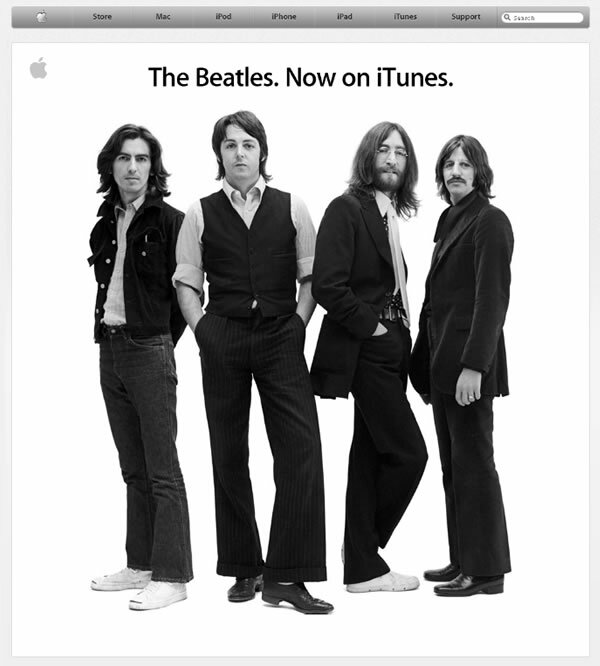 The Beatles are on iTunes. I WAS TOLD THAT Tomorrow is just another day you won’t forget. All that hype for that? Sure I love the Beatles. I’m sure we have several of their songs that we’ve ripped from CDs to MP3s. Maybe worth mentioning in a banner ad….. not a home page blow up. Don’t deceive your anxiously awaiting Tribe or Cult or whatever you have following you Apple with a tease of something big. Oh BUT wait – not only does this Beatles on iTunes thing get huge website coverage – the news is headed to your TV screen with a whole series of commercials. Big apologies to my team for pausing for that 30 seconds. Totally not worth it! There are a few things that are causing the Apple iTunes getting the Beatles to be such a hype in Apple’s eyes. Getting the Beatles to iTunes in an exclusive agreement (that goes thru 2011) signifies victory over the traditional old school music industry. Steve Jobs has apparently been working on this for years. I’m sure he’s paying a pretty penny for this. Also- Apple Corp is owned by Paul McCartney, Ringo Starr and the widows of George Harrison and John Lennon (Yoko Ono). Apple Corp? Apple, Inc? Similar? Yes. There has been a on-going feud since 1978 over trademark and symbol and yadda yadda. I guess this does mean big business for all of the baby boomers who can’t rip their CD’s or vinyls and must get their hands on all things Beatles. Grandma’s going to want an iPod! Maybe that’s what Apple was hoping for I’m sure. Well guess my guesses from yesterday were wrong. I guess after all these year’s the Beatles are still a big thing.